The Nuclear Decommissioning Authority (NDA) is responsible for cleaning up the legacy from the UK’s pioneering post-war nuclear programme. From the late 1940s onwards, the country’s smartest scientists led the world with ground-breaking discoveries, gradually building a diverse collection of experimental facilities for the UK’s defences and, later, to provide electricity for its citizens. 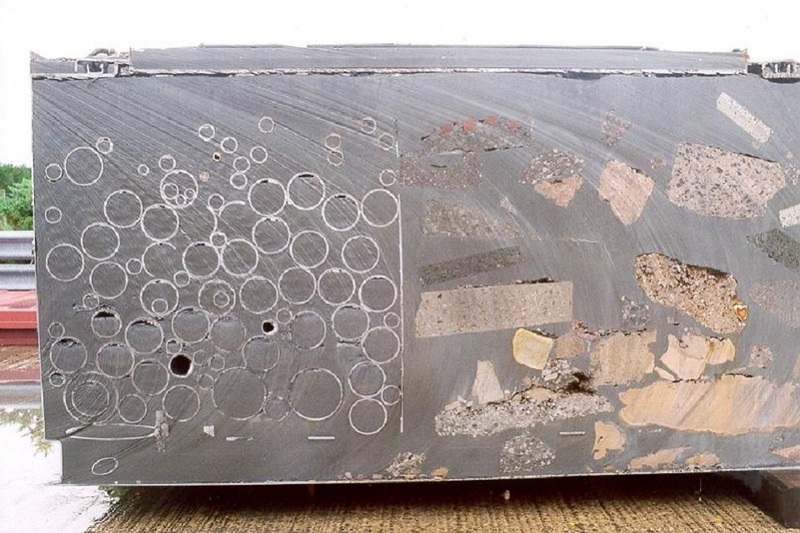 Many of the designs were unique; producing radioactive wastes and spent fuel that no-one had ever dealt with before. Structures, pipework, container vessels and land became contaminated and were mostly left for a future generation to clean up. Many years later, the NDA is dismantling this historical legacy, demolishing structures and preparing sites for future uses. The mission will stretch for another 100-plus years and cost more than £100 billion. Dealing with such a range of complexities and uncertainties requires fundamental science, innovative thinking and novel engineering. Progress depends on clearly understanding the problems, finding solutions and ensuring the cost for taxpayers remains acceptable. 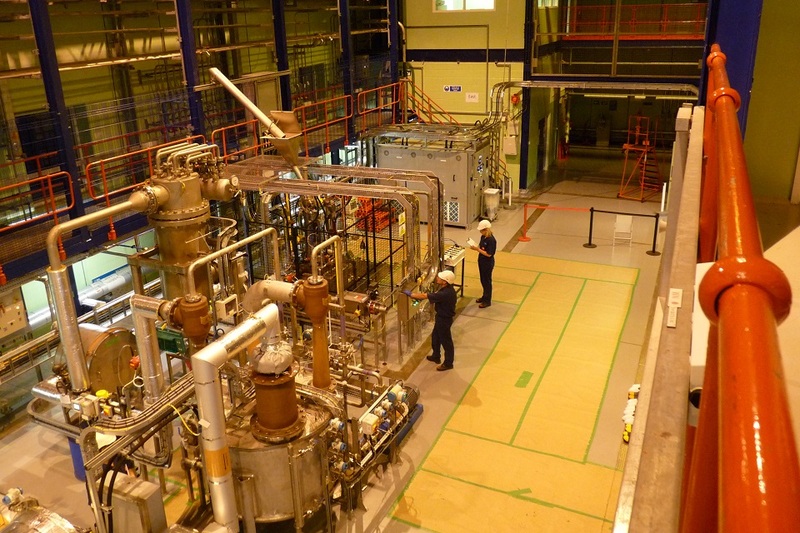 Research & Development (R&D) is therefore an essential part of decommissioning programme. The aim is to solve the challenging technical problems more effectively, more efficiently, more safely and, where possible, for less cost. A total of approximately £101 million was spent on R&D during 2017 to 2018. The bulk of this forms part of the budget allocated to our Site Licence Companies (SLCs) and subsidiary organisations, and is aimed at addressing specific on-site challenges identified during decommissioning activities. The work is carried out by SLCs, the subsidiaries and through contracts awarded to their supply chain. Separately, the NDA also funds a strategic portfolio to commission projects directly, particularly in areas with potential to have an impact across a number of sites, or to develop our overall strategy. This kind of research may help shape and develop our strategy, encourage early innovation or maintain key technical skills. This portfolio is called the NDA Direct Research Portfolio (DRP). 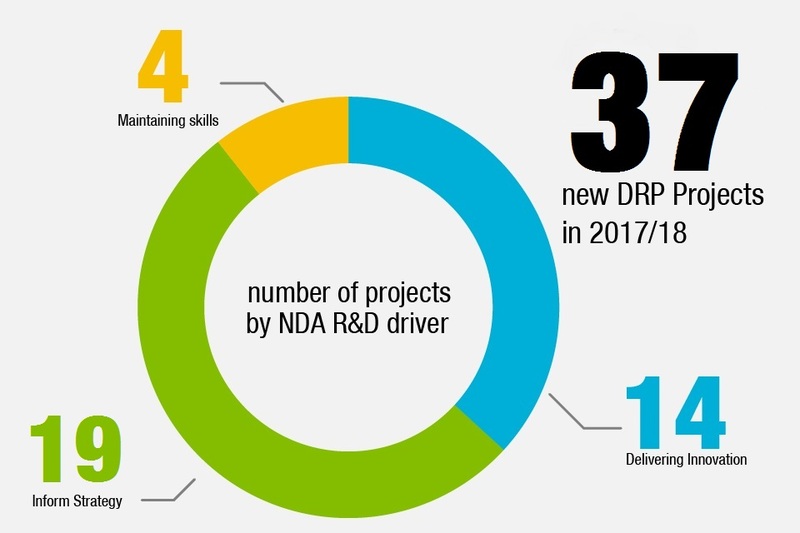 The DRP is a key component of the overall R&D programme. 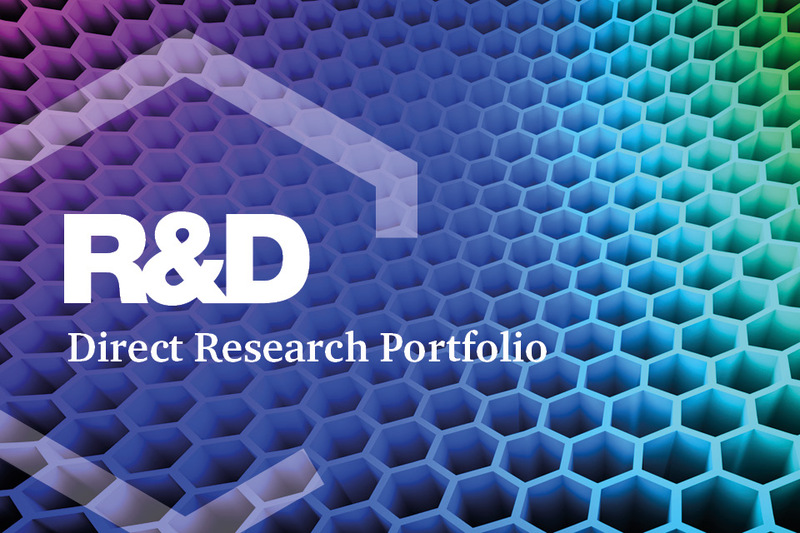 It accounts for approximately £5 million of the annual investment and represents an important area of overall support for R&D across the group’s 17 sites and subsidiary organisations. 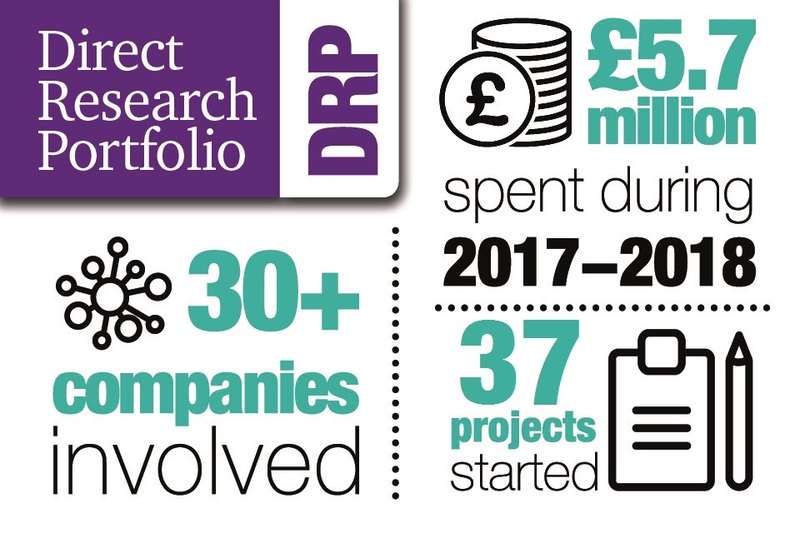 Overall, 9 consortia comprising around 70 organisations are involved in the DRP, ranging from UK universities and research bodies to global corporations and small businesses. 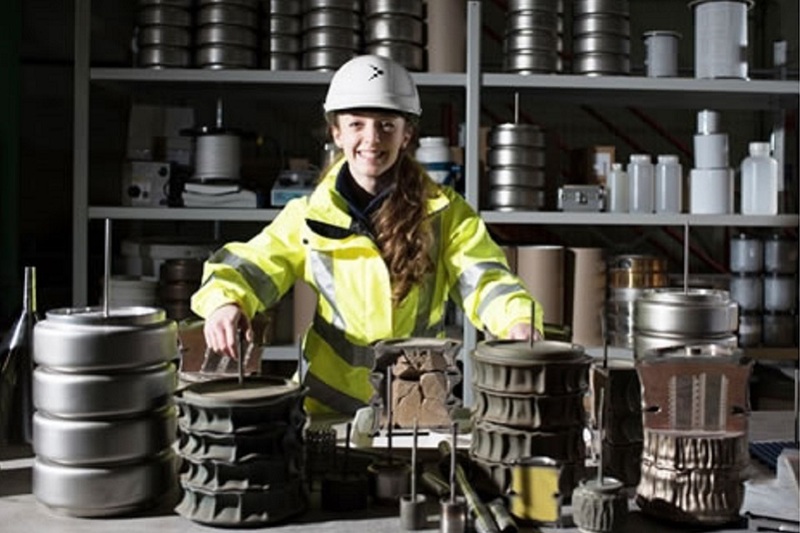 Topics for individual projects are identified either by NDA’s internal technical experts or through the members of the Nuclear Waste and Decommissioning Research Forum (NWDRF), a cross-industry forum which promotes collaboration across the UK on nuclear decommissioning R&D. This report outlinesthe projects funded through the DRP during 2017 to 2018, with case studies on some key projects. Some are ongoing from earlier contracts, but all have potential for a significant impact across the NDA group of businesses. Further information on NDA’s R&D programme can be found in our 5-year R&D plan. We need to maintain and develop sufficient high-level expertise to support decommissioning as the mission moves forward over the next 100-plus years. 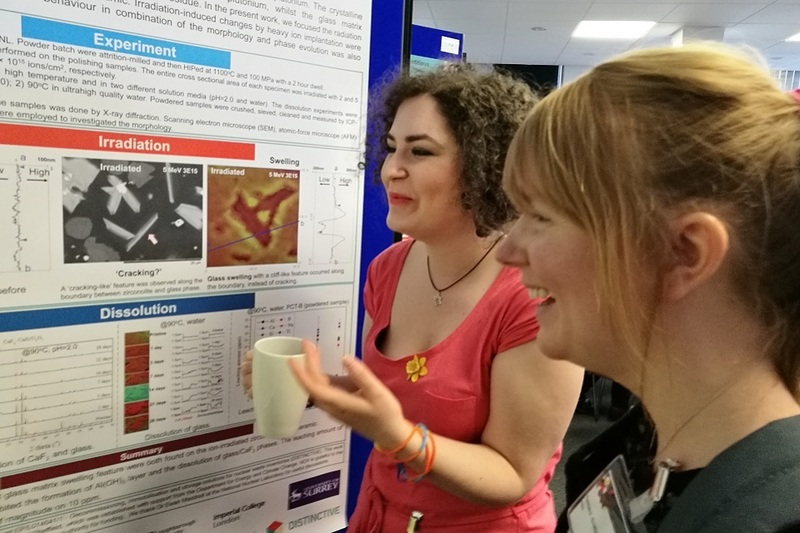 We therefore invest in a range of university research programmes targeted at decommissioning, and fundamental supporting topics, while supporting wider collaborative research programmes that align with industry requirements. 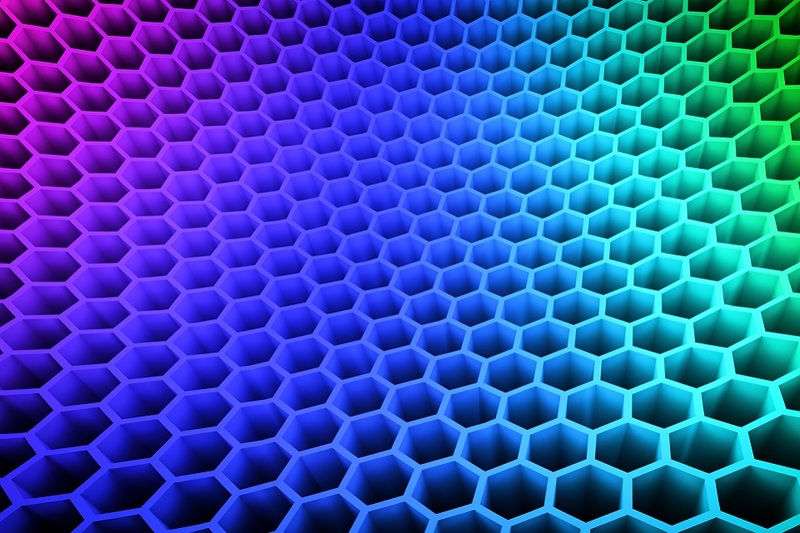 We are looking to understand how graphene, an emerging technology, could improve delivery of NDA’s mission, and have therefore commissioned a review of graphene properties, the latest associated developments and areas for potential deployment in decommissioning. We’re always seeking alternative, as well as cost-efficient, solutions for immobilisation of large quantities of mixed, diverse radioactive waste. An integrated project team has been working on adapting existing thermal treatment technology to produce stable, passively safe material that can be disposed of in a Geological Disposal Facility. NDA has developed an information resource to share among all professionals involved in land remediation, including site employees and contractors. This is aimed at ensuring the latest techniques and regulatory guidance is adopted and the latest techniques are shared. A continued supply of cement powders is vital for encapsulating UK higher activity radioactive wastes before packaging, storage and eventual disposal. However, supplies depends on by-products from UK industries that are in decline. 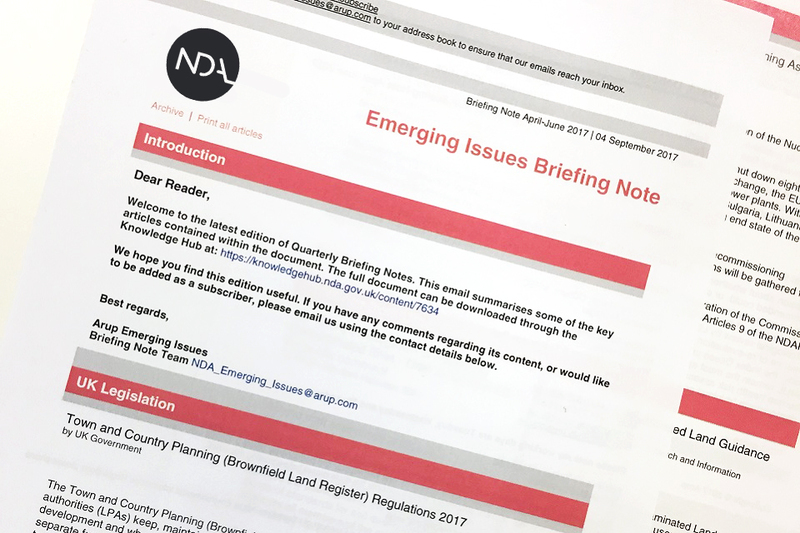 We have therefore carried out a review into current issues and outlined options for managing future risks. Some UK plutonium stocks are unsuitable for re-use as a component of new fuel and we require a different way to deal with these stocks. We’re working to identify and develop immobilisation technologies, which include refinement of an existing thermal treatment process: hot isostatic pressing. Wood Brenk Systemplanung, Jülich Research Centre, Andra, Cogentus Consulting, DAS, Imperial College London, Longenecker & Associates, MMI Engineering, NuVision, OC Robotics, Fortum, University of Birmingham, University of Bristol, University of Cambridge, University of Manchester. Arcadis AdvanSci, Applied Photonics, Areva RMC, Aurora, ESI, MDecon, Pöyry, ProNu-Dec, Tradebe Inutec, TWI, University of Liverpool, Dalton Nuclear Institute, University of Surrey. Arup Costain, Pöyry, Studsvik, James Fisher Nuclear, SN3, AdvanSci, MCM, Bilfinger GVA, Pinsent Masons, CL:AIRE, r3 Environmental Technology, Dalton Nuclear Institute. Eden Nuclear and Environment Cavendish Nuclear, DBE TECHNOLOGY GmbH, Golder Associates, Tradebe Inutec, Project Time and Cost International. Galson Sciences National Nuclear Laboratory, Frazer-Nash Consulting, Advansci, Amphos 21, Cogentus Consulting, Integrated Decision Management, Jacobs, Kurion, Rodgers Leask, VTT, University of Bristol, Lancaster University, University of Leeds, University of Manchester, University of Sheffield. NSG Environmental AECOM, ARC, Oxford Technologies, NPL, ESG, Quintessa, React Engineering, KDC, Tradebe Inutec, Synergy Health, Nuclear AMRC, Loughborough University, University of Manchester, University of Surrey. Wood Andra, Brenk Systemplanung, Jülich Research Centre, Imperial College, DAS Ltd, Fortum, MMI Engineering, NPL, NRG, OC Robotics, Studsvik, University of Birmingham, University of Manchester, University of Bristol, University of Cambridge, Loughborough University. Orano NSG Consultancy, MDecon, Quintessa, University of Liverpool, University of Sheffield. National Nuclear Laboratory Frazer-Nash Consulting, Galson Sciences, ALD France, Aquila Nuclear Engineering, DBD, DAS, IDM, Jacobs, Kurion, Rodgers-Leask, University of Bristol, Lancaster University, University of Leeds, University of Manchester, University of Sheffield, Imperial College.